He just might have been the inspiration behind the Iron Man series! And now, you can have The Spider as a highly detailed 1:6 scale action figure that comes with a fantastic array of accessories. 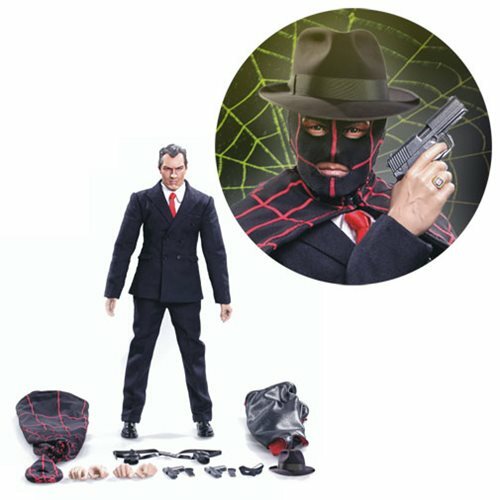 Go Hero and Executive Replicas are thrilled to bring you this 12-inch tall action figure of the pulp fiction action hero, complete with an outfit consisting of 1940s style shoes, a dress tie and dress shirt, 1930s style two-piece suit, fedora hat, hood (serial version), removable mask, and 2 capes! Plus, The Spider even includes some awesome accessories like a couple of .45 automatic guns, underarm holster, 3 sets of hands, plus base with stand! Ages 15 and up.